Graduation is right around the corner and it's every parent's dream to watch their little princess walk across the stage wearing a graduation dress that says she is beautiful, wonderful, and accomplished. It is the princess who wears the graduation dress but it's the dress that helps the little princess feel nothing but oh so beautiful during her shinning moment. Her moment to shine is the moment she will never forget and neither will her friends and family. It's the moment that defines not only her achievements but also her parent's achievements as well. It is nerve wrecking sitting through the ceremony waiting to hear her name be called so that she can walk across the stage. So many things run though her mind that day and her main concern need not to be on her appearance. She might be nervous standing in front of her friends and family and all she wants to do is look her best and having a beautiful graduation dress is the perfect way to put her mind at ease. Her graduation moment is forever remembered and it's nothing like a graduation dress that will only make the moment unforgettable. 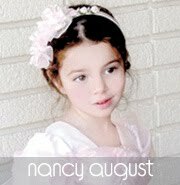 To find the perfect graduation dress visit NancyAugust.com and see the collection it has to offer for your elementary and middle school graduate. There is nothing like a little blue dress. Much like adults, I believe every little girl should have a staple little pink dress in her closet. 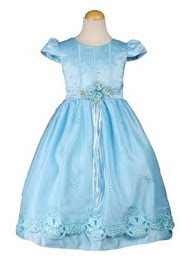 My graduation dress pick of the week is our Baby Blue Flower Girl Dress item 7923G-BL. Blue is a color that compliments all skin and hair colors. This cute little number is dressy enough for graduation but more importantly not over the top. After all, your little graduate is the star of the show not her dress. Be sure to put the finishing touches on her outfit with some adorable ruffle socks. Also see NancyAugust.com's new girls jewelry collection that will be a great graduation gift! Click here to shop for graduation dresses!! !